With Olé Publishing company you will reach the numerous Finnish households with consuming power in Spain. Olé Publishing is the leading Finnish publishing company in Spain. 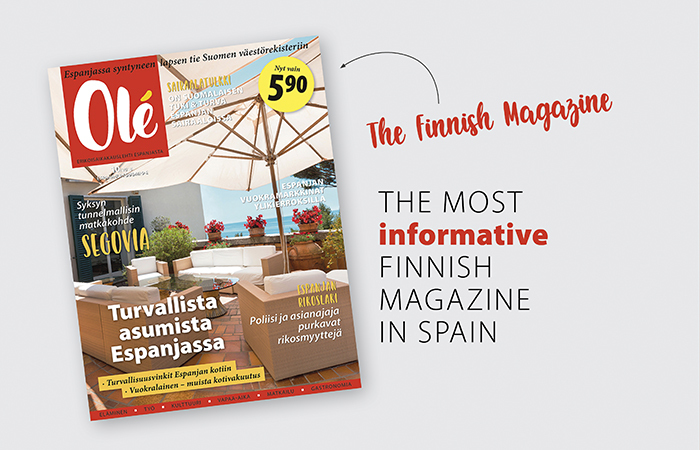 With our two products, the subscription-based “Olé Magazine” and the free newspaper “SE”, we reach almost every Finnish household with an existing link to Spain. The first issue of Olé Magazine was published in the summer of 1985. Since then, we have been building our impeccable image and are now considered “the most reliable Finnish-language media in Spain”. With our subscription-based readers, advertising in the magazine you ensure the visibility in the households that have an existing link to Spain with a high purchase power. The magazine is published 11 times a year. As our readers tend to travel around a lot, they have the chance to download it in their computer or mobile device for free as well as getting a paper-copy. Our free newspaper SE has been published since 1991. It comes out twice a month. In our newspaper we provide practical and local information and news about the most popular areas among the Finns in Spain, such as the Costa del Sol (Málaga) and the Costa Blanca (Alicante). During the summer season the newspaper is published once a month and it’s content is aimed for the Finnish tourists visiting Spain, as the winter residents normally spend the summer in Finland. Thus, in the summer we provide the tourists with information about travelling, dining, amusement parks etc. In our publications we have a permanent section for real estate agents. By publishing your property-listing in the market place, you can capture our readers as your clients. Many consider the Finns ideal customers, as they have a solid reputation on being reliable and honest clients. According to an article published in the Málaga area SUR newspaper half of the properties sold in the Costa del Sol are sold to foreign residents. The Finns form an important part of this group. We design your ad – for free! If the client so wishes, we design the advertisement according to his or her wishes – for free. You don’t necessarily need your own advertisement agensy when you advertise with us. For more information, please contact with us. We will be happy to provide you with more information and make you a competitive offer! Heidi Roikonen is your contact person for all the matters relating to advertisement material. • Mistakes in the advertisment layout caused by inadequate or faulty material, unreadable handwriting, an ad or a correction given via telephone, lingual or translational mistakes if the advertisment is translated by the editorial without any separate payment. • Possible damage caused by omission of the advertisment. • Mistakes appearing in the print delivered to the advertiser, if the advertiser has approved the proof without doing corrections, or if the advertiser has failed to return the prooft by the deadline. • The editorial responsibility for omission of the advertisment or mistakes in the publication are limited to refund of the amount paid for the advertisment.